Welcome to my video course “250 Dutch Proverbs”. I made a selection of proverbs and sayings that anyone who learns Dutch should know. The course consists of 25 lessons. In each lesson, I explain the meaning of 10 proverbs or sayings.Subtitles are available for each lesson. You just push the CC button in YouTube. The transcript of the lesson you find on Learndutch.org.And here you see the drawing of today of Kata from Hungary. It represents 1 of the 10 proverbs of this video. By the end of the lesson, I show you the drawing again. Your task to guess which proverb it is. Let’s start with lesson 16, containing proverbs 151-160. Literally: to walk a blue one. The meaning: to get a rejection. Although it can be related to any request that is turned down, in most cases when this expression is used, it is about love. The one who is walking a blue one – is the one who is being rejected. If you want to include the information who rejected, then you use “bij”. For example: Jan heeft een blauwtje gelopen bij Marieke. Marieke rejected Jan. Literally: according to Bartjens. Of course, this is a saying that I like a lot. You use it when you come to a conclusion using a very straightforward way of reasoning. Now who was Bartjens? Bartjens was a mathematics teacher who wrote children’s mathematics books. These books where used in the Netherlands for two centuries. And as such – the statement “according to Bartjens” became used so much that it turned in to a proverb. Of course I hope, if my courses reach the same popularity… well perhaps one day this proverb is changed into “according to Bart”. Literally: a bunch of wood at the door. This expression is used when a woman has a large bust. In the German language this saying exists as well. Literally: a one-penny flute. The meaning is something very easy. There was a time that you could buy a flute for just a penny. But it was a very simple one. So playing on it was also not difficult. Literally: to get old cows out of the ditch. You use it, when someone starts telling about something (usually negative) that happened a long time ago, which is absolutely not relevant anymore. Often used as a counter-attack on a current blame. For example, your friend has broken your bike. You say you don’t like that. And then he comes up with a story of 10 years ago, where you did something to him. Literally: participate for bacon and beans. It can be used in two situations. First, if you participate in a contest but you don’t have the intention to win, and perhaps you even ask not to be listed in the results. Then you say: ik doe mee voor spek en bonen. Nothing negative about that. But the second situation in which you use it, is when someone comes to the conclusion he is being neglected: that his participation (in an activity or a discussion) is useless, because no one pays attention to him. The origin of the expression is actually when someone worked without getting paid, but got in return a meal (the bacon and beans). Literally: the apple doesn’t fall far from the tree. This is the same as in English. Children act like their parents. It can be related to behaviour, but also to for example hobbies and skills. Literally: the drop that made the bucket overflow. And the English equivalent is the straw that broke the camel’s back. The expression is used in a situation when negative behaviour accumulates till the moment that it is not accepted anymore. The last thing that happens, is seen as the last “drop”. De laatste druppel. Literally: strike while the iron is hot. You can only change the shape when the iron is hot, not when it’s cold. So it refers to the moment that you should undertake action; to take the opportunity when the conditions are most favourable. Literally: a storm in a glass of water. English equivalents: tempest in a teacup or storm in a teacup, meaning an exaggeration out of proportion of some small event. Here you see the drawing of Kata again. One of the proverbs of this lesson. I hope you are able to determine which proverb is represented here. According to Bartjens it should be a one-penny flute. 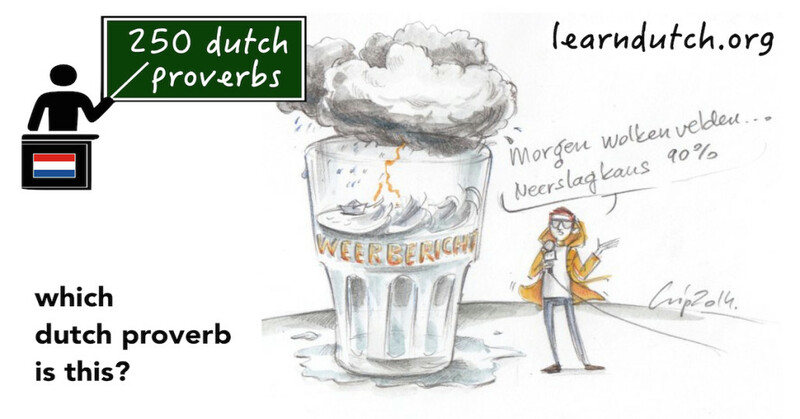 See you back in lesson 17 of 250 Dutch Proverbs.